For any party, this fry is a best choice for starter. This can also be served as tea time snack or served with any rice variety. 1. Cut cauliflower florets in to bite sized pieces. Clean and wash the florets. 2. Put the cut florets in hot water for few minutes and then drain water. 3. Now combine all the other ingredients except oil. Sprinkle just a little water while combining the ingredients. 5. 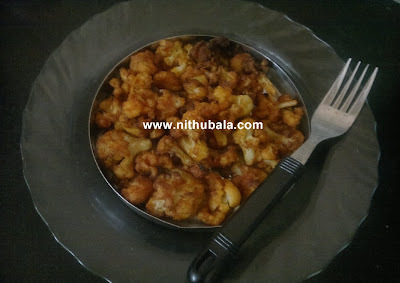 Heat oil and deep fry the cauliflower till crisp. Serve with a ketch-up as starter or evening snack. This goes to Sowje's "Clearly Fresh Giveaway" Event. Perfect snack....looks crispy n delicious! Looks delicious.. Perfect as a starter..
awesome and yum yum crispy cauliflower fry. Crispy & such a tempting and quick snack..Different from regular bhajias..Bookmarked!! hi chitthi, its me. cauliflower my favorite.so tasty.yuuuummmm.pie recipes?expecting one when i come there.